The Brandon-Kelly-Dylan love triangle lives on. Old Navy's back-to-school campaign tries to tie some of our favourite Beverly Hills 90210 characters into an ad for their new 'famous' jeans. 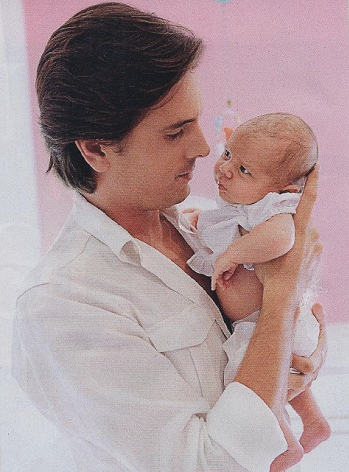 In typical Kardashian fashion, Penelope Scotland Disick made her public debut on the cover of a tabloid. It's not very Suri Cruise of her, but not all 'celebrity' offspring can be revealed through Annie Leibovitz's exquisite lens. Back to Penelope. The one-month-old has a new family initial (P, duh) but has one thing in common with her infamous clan: she's already weary of her father. Just look at the way Penelope glares at Scott. It's like she knows he's a douchelord (Khloe's word, not mine). Baby P also looks a bit frazzled by her tabloid debut. Think she'll vie to live her life out of the spotlight? Doubtful, but you never know.